LOS ANGELES, Calif. /California Newswire/ — Featuring in-person appearances of more than five dozen celebrities from classic motion pictures and television, The Hollywood Show has emerged as one of the world's most celebrated autograph and photo-opportunities for fans, and the upcoming 2013 event will feature country singer, and Shady Hill Records recording artist, Sandra Piller on Friday, Saturday and Sunday, April 19-21. The chart-topping Shady Hill Records recording artist will be appearing at a vendor table with her mother, actress Sandra Giles, whose credits include roles in "Columbo," "Quincy, M.E.," "Land of the Giants," and many more. "We always have a great time at The Hollywood Show," Piller says, "and I'm especially happy to meet fans of my music as well as fans of my late husband, Michael Piller." As the writer and producer of several hundred episodes in the Star Trek film and television franchise, Michael Piller is fondly remembered by fans across the world. "Not only is it fun to talk with so many wonderful people, but it is a thrill to interact with stars we've seen in so many different movies and TV shows," Giles adds. 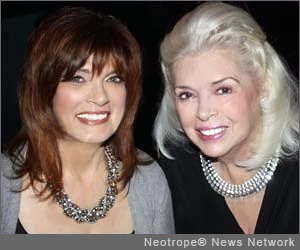 The two Sandras are the first mother/daughter celebrities to be featured at The Hollywood Show. "We're going to have photos, CDs, some of Michael's Star Trek memorabilia, and even some free give-aways at our table," Piller notes, "so I hope everyone will stop by to say hello. And we might even play some country music!" Giles notes that "It's going to be nice to catch up with actors and actresses I've seen on set or while in make-up. With all the great fans, this show could turn into quite a party!" Among the stars listed on the event website as appearing at this show are Angie Dickenson, Stella Stevens, Carol Lynley, Nancy Allen, Tippi Hedren, Mamie van Doren, June Lockhart, Dean Cain, Loni Anderson, Howard Hesseman, Tim Reid, Jan Smithers, and Lou Ferrigno. Musicians set to appear include Mickey Dolenz, Mark Lindsay, Denny Laine, Chris Montez, Spencer Davis, Bo Donaldson, and Bob Berryhill. This edition of The Hollywood Show begins Friday night, April 19, and continues on Saturday and Sunday, April 20-21 at the Westin Los Angeles Airport Hotel located at Westin Los Angeles Airport Hotel, 5400 W Century Blvd, Los Angeles, CA, 90045. Show times are from 6-9pm on Friday, 10 a.m. – 5 p.m. on Saturday, and from 11 a.m. – 4 p.m. on Sunday. Sandra Piller's latest EP, "Love Goes On," contains six songs dedicated to her late husband. "Love Goes On" is available on iTunes, Amazon, and all the usual places for physical and digital distribution and autographed copies may be purchased from Sandra at The Hollywood Show. Started in 1979, The Hollywood Show is legendary among autograph shows, not only for the celebrities who appear, but the crowds each event brings. Currently taking place in Los Angeles, Calif., The Hollywood Show has earned the reputation of being "the place" for celebrities to sign autographs and pose for photographs. Plus, it is recognized worldwide as the perfect place for fans to get "up close and personal" with their favorite stars. For more information on Sandra Piller, please visit her online at http://www.sandrapiller.com/ . MEDIA CONTACT: John Scott G, G-Man Marketing, 818-223-8486. Sandra Piller "Love Goes On"